The point of a vacation is to get away from it all, right? And yet so many trips can easily turn into a mad dash to cram in all the sights the city has to offer. Don’t let that happen to you. 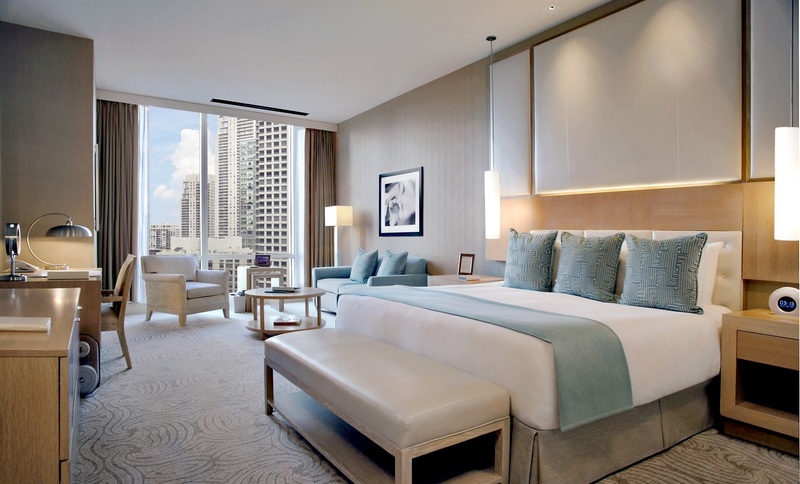 Next time you’re vacationing (or staycationing) in Chicago, set aside some time for quality rest and relaxation. These top-rated hotels boast the best day spas the city has to offer, making it easy to sit back and enjoy a deep-tissue massage, restorative facial or an indulgent mani-pedi. 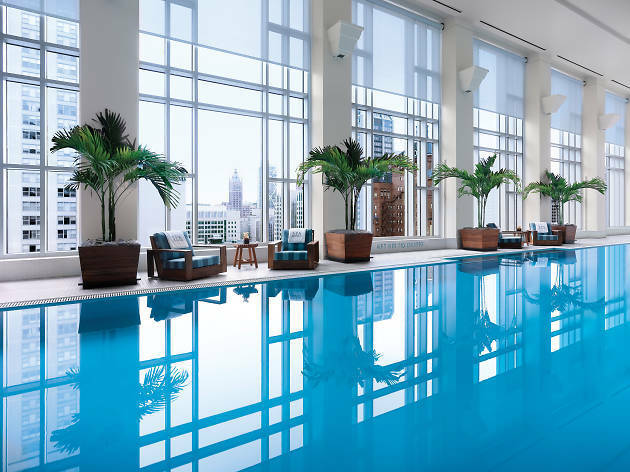 A chance to take in Chicago's sprawling skyline is a must for visitors and residents alike, and the floor-to-ceiling windows that surround the Peninsula Spa’s half-Olympic–length pool offer just that. Toss in a fully equipped fitness center, a 19th-floor sun terrace and a yoga room, and you've got everything you need to fully relax. Of course, if you want to up the ante, book one of 11 spa retreats, with options like the Peninsula Radiance package, which includes 3.5 hours of age-defying treatments. 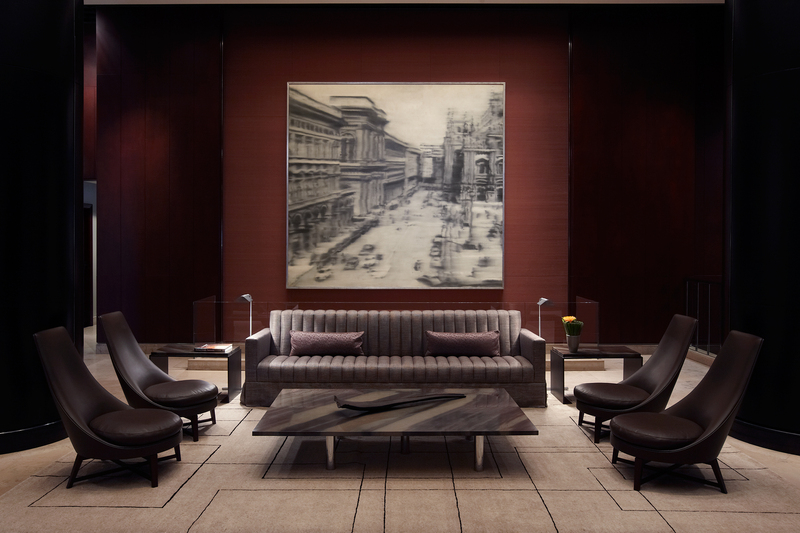 Housed inside a building designed by world-renowned architect Mies van der Rohe, the Langham is a special part of Chicago's downtown tapestry. 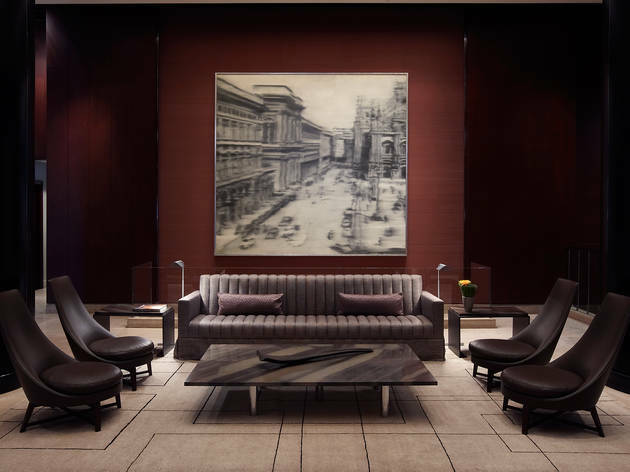 Beyond its stately digs, the hotel is home to Chinese-influenced Chuan Spa, a serene space that specializes in holistic treatments using five elements: wood, fire, earth, metal and water. Every spa experience begins with the Chuan bathing ritual, after which guests can choose from any number of treatments and packages. The spa also features a number of traditional Chinese medicinal treatments, as well as a steam room and a healing liquid pool. 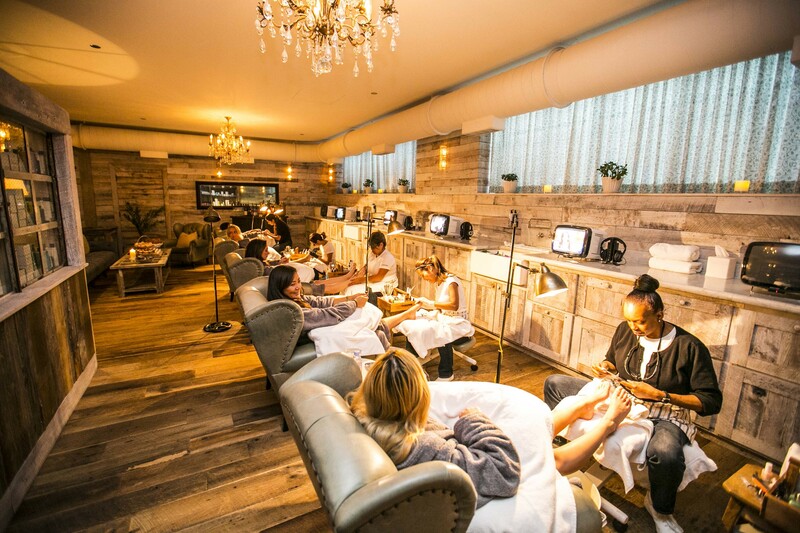 You don't have to be a member to stop in and enjoy Soho House's Cowshed Spa in the West Loop. 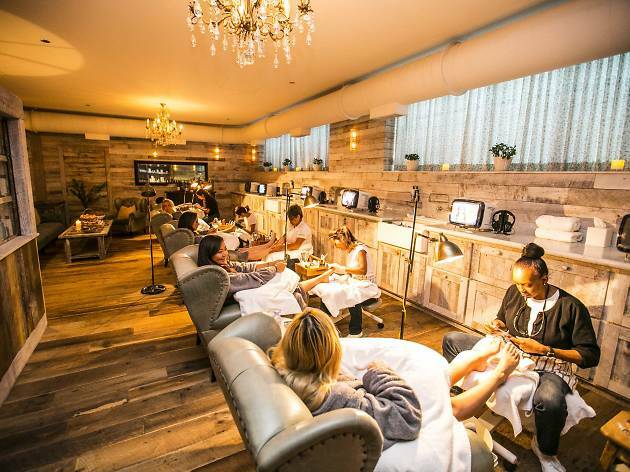 The subterranean space boasts retro-relaxed vibes and a curated treatment list that covers facials, manicures and pedicures, body therapies, massages and hair removal. Raved-about offerings include the Ultimate Cowshed Pedicure (which includes an indulgent foot mask) and the Evening Primrose Body Wrap that ends with a mini-facial. Your specialist will jot down which products were used so that you can opt to take home the experience by purchasing Cowshed goodies on your way out. This boutique hotel is all sorts of hip, but it also has the goods to back up its “we don’t use any capital letters” swagger. Its spa offers an assortment of massages, facials, nail treatments, body wraps, peels, waxings and scrubs. 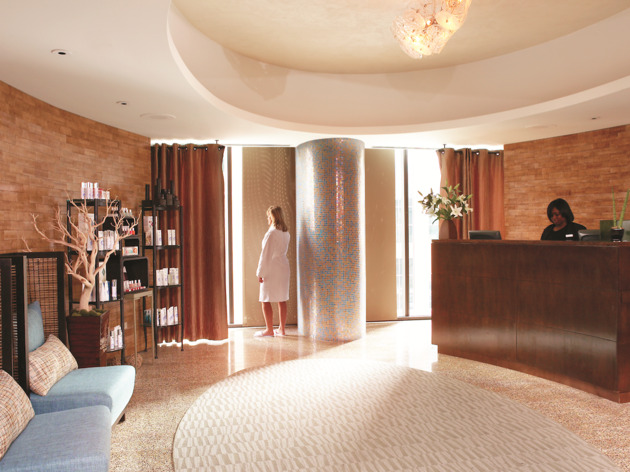 Guests have the option to bundle several treatments into one visit with the hotel's assortment of packaged deals. Go all in with the “perfectly polished” option, which includes an 80-minute massage, a 50-minute facial and a white tea-cucumber mani-pedi. 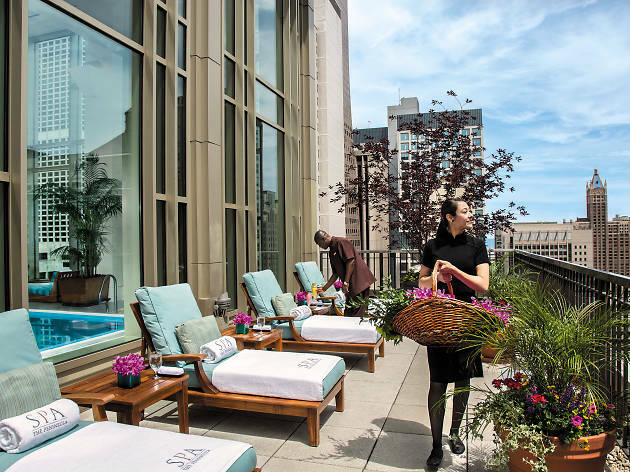 If you have less time to spare, choose “beauty on the go,” a 75-minute retreat that includes an eye treatment, a classic manicure and brow waxing while rooftop bar Apogee provides relaxation methods of a slightly boozier nature. 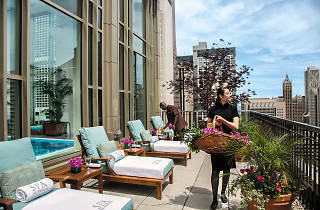 With a location just off the Magnificent Mile, the Four Seasons is a great place to stay if you’re into retail therapy. But after a long day of shopping—or working, or sightseeing—it’s also nice to relax in a slightly more traditional sense. That's where the hotel's unique spa treatments come into play. Brown-spirit aficionados will love the vintage bourbon massage, which uses a scrub crafted with brown sugar and Kentucky bourbon. After your massage, head to the hotel bar to grab a pour of Knob Creek Barrel Select bourbon on the house. 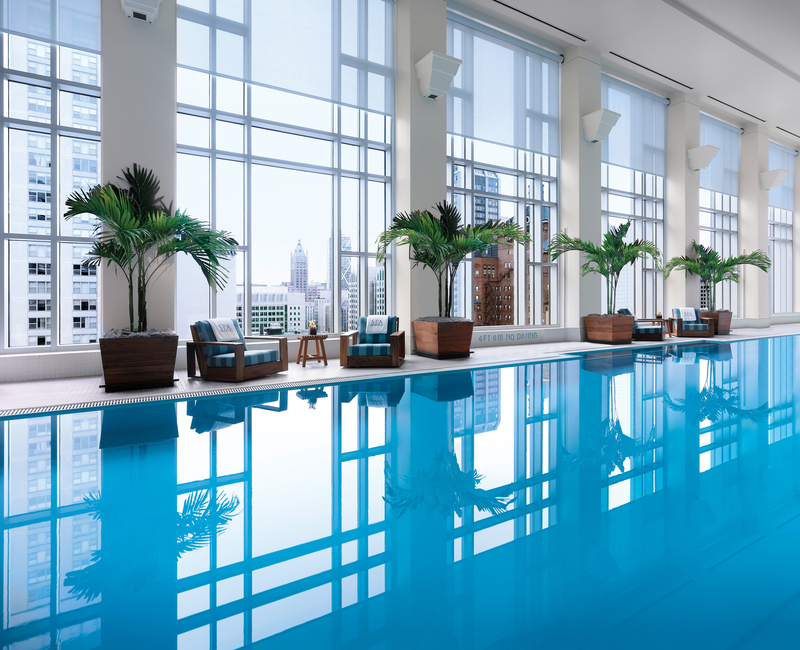 If you’re looking to relax in a hurry, then the spa at Loews Chicago Downtown is the place to be. 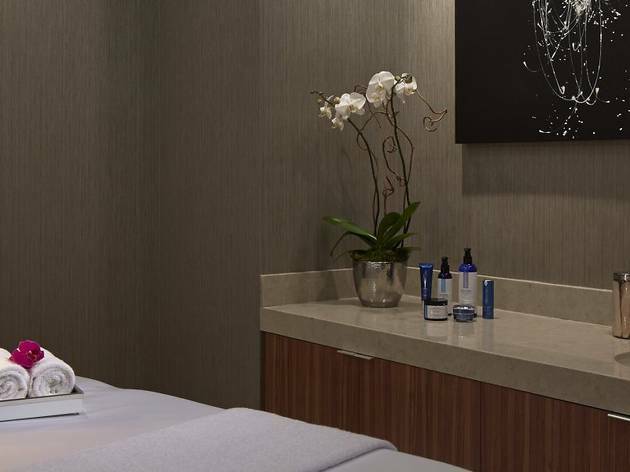 In addition to a full suite of standard spa services—massages, facials and mani-pedis—Loews offers a series of on-the-go services that each take only 25 minutes. 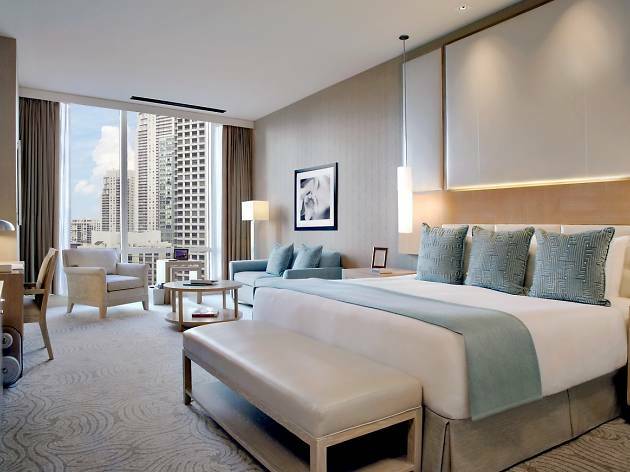 And since the hotel is located in Streeterville—with easy access to the Magnificent Mile, the Loop and Millennium Park—the odds that you’ll be short on down time are high. 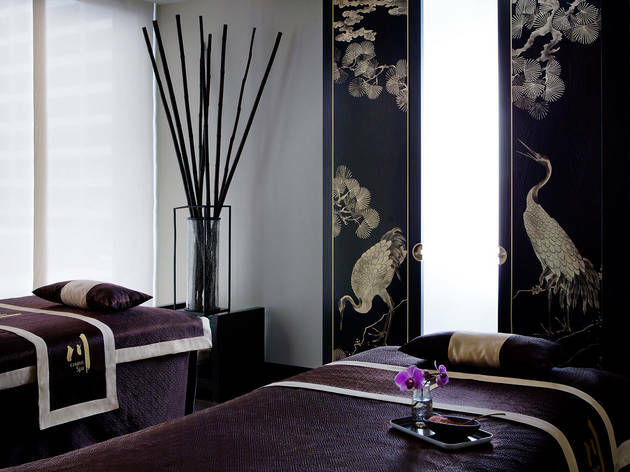 Downtown Chicago might seem like an odd place to go for rest and relaxation, but that’s exactly what you’ll find in the Park Hyatt’s NoMI Spa, where you can choose from a lineup of services including massages, facials, mani-pedis, waxing and full body treatments. House specialties include the Hydrafacial, which promises medical-grade results minus the downtime, and a customized massage service that the NoMI staff can adjust to meet your personal needs. 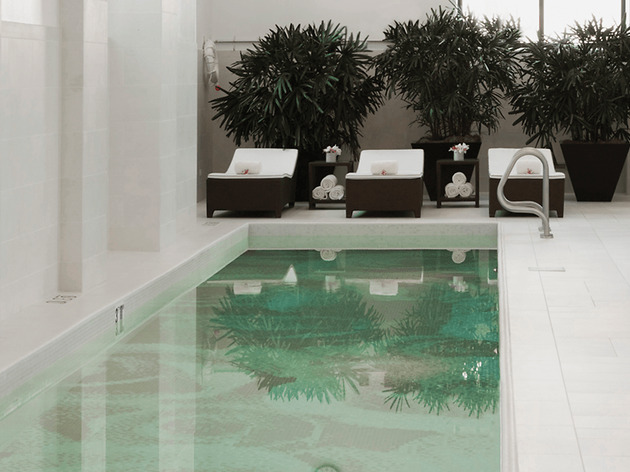 When you visit the Spa at Trump International, you can choose from numerous individual services, like their signature gemstone massages and full body therapies. There are a handful of couples packages, too, as well as a full-service fitness center that offers private training and group classes. But to really get the full experience, you should stay at one the hotel’s special Spa guest rooms, which are secluded on two floors, provide direct access to spa and come with extra amenities to help you relax. 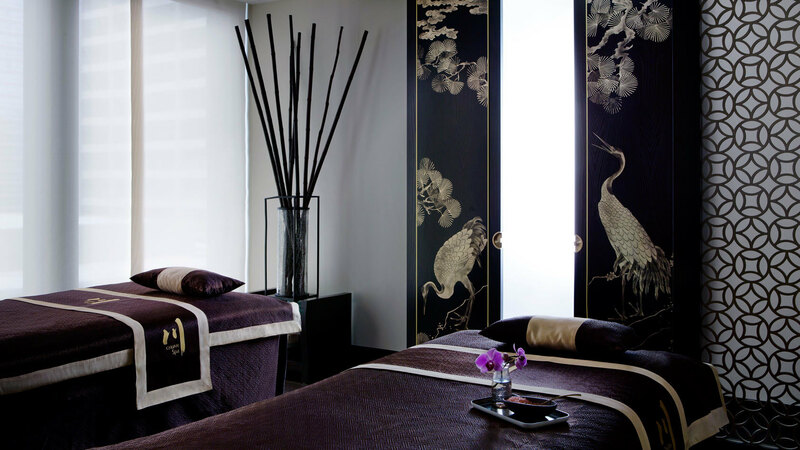 If you’re looking for the most comprehensive spa experience in the city, this is it. When searching for a hotel that’s going to give you a great spa experience, it helps to go fancy. And you know what’s fancy? The Waldorf Astoria. Their Chicago location in the Gold Coast has 215 rooms, each of which comes with its own deep soaker tub—in case you want to relax on a budget. 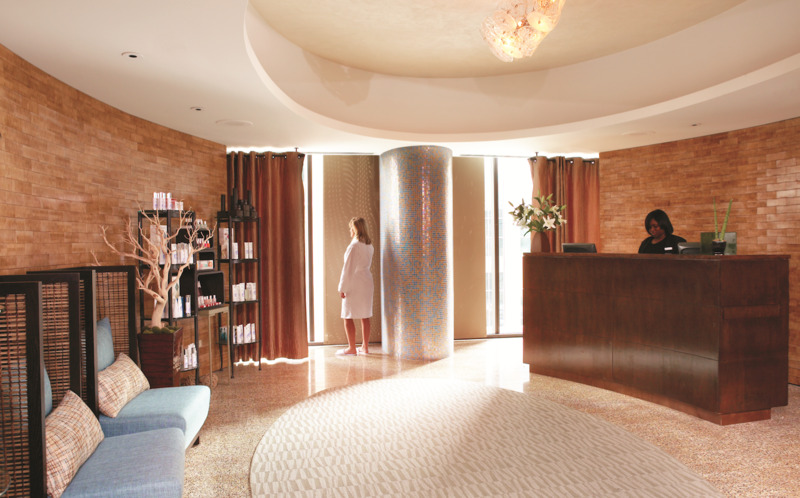 Otherwise, the spa facilities offer a full menu of massages, waxes, tints, facials, body treatments and cleanses. They even do makeup—perfect for a night on the town.